Limited storage capacities are currently still the rule with many Notebooks. The amount of data taking up space on the computer is constantly increasing, and that’s not just as a result of the Internet. The time is rapidly approaching when a hard disk will reach the absolute limit of its storage capacity. monitored as well – and all of this in real time. 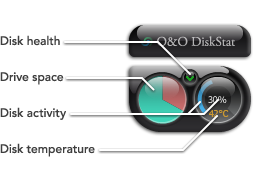 The status and space of the hard disk are displayed along with its temperature and level of activity at the time of evaluation. Green signifies normal, while orange indicates a range beyond that, and red is a sign of possible failure or diminished performance.